Today, Madame Tussauds unveiled their latest wax figure, Alex Ovechkin. Check out more at RMNB. I have yet to fully embrace the non game Caps events, therefore did not make the unveiling, but they have it covered. 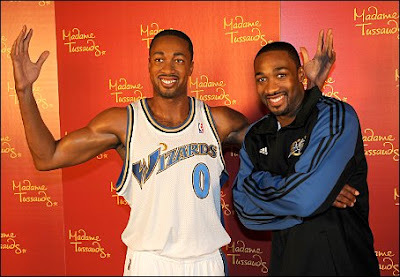 The last big unveiling was back in 2008 when the DC Madame Tussaud's released a wax figure of (at the time) the biggest DC sports star, Gilbert Arenas. Well needless to say, the Legend of Gilbert Arenas went downhill fast. Injuries, and...what was it...I can't remember...oh PLAYING GUNS WITH AN ACCUSED MURDERER! While Gilbert was injured before the wax figure came out, he never was the same after. 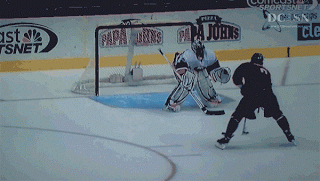 He tried to come back a few times that season, but he was clearly still hurt. 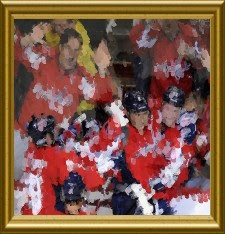 As quickly as he grew to be a DC sports hero, he became a DC sports goat. Eventually, after some "jail" time Gil and his 100 Million Dollar Contract was gone from DC for good. The wax figure remained.